Lately I’ve been on an Alphonse Mucha kick, largely because I seem to be spotting books and calendars on Mucha wherever I look. It’s been fun for me to peruse through these items, because I love the flowy, gauzy female figures that appear in his posters and prints. 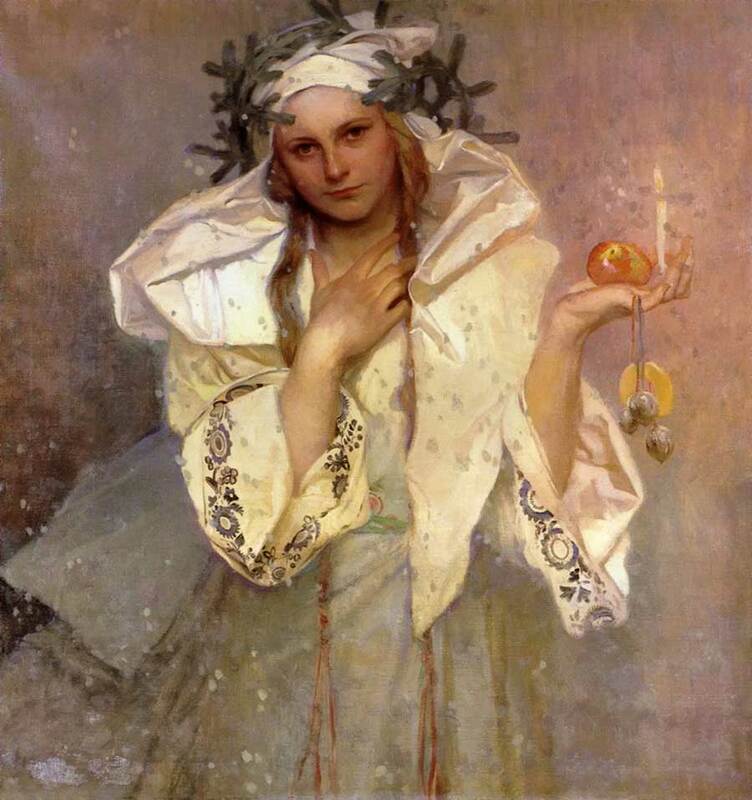 I thought it would be fun to highlight some Mucha images that are appropriate for this holiday, wintery season. I’m especially drawn to his depiction of Winter (shown above) from his 1900 series of The Four Seasons. (Although this image of the series does not seem completely true to Mucha’s original colors, I still like rich tones quite a bit.) 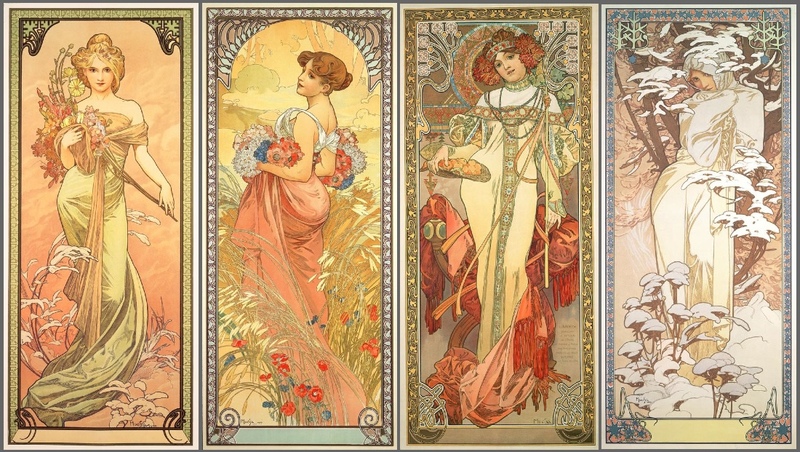 Mucha also did other series of The Four Seasons in 1896 and in 1897. These days, given my recent fascination with Mucha, I’m beginning to familiarize myself with more of his other works of art, as well as his biography. Alphonse Mucha was born in Moravia, an area in Central Europe which was part of the Austro-Hungarian Empire and later Czechoslovakia during Mucha’s lifetime. As an adult, Mucha lived several places in Europe, including Paris. 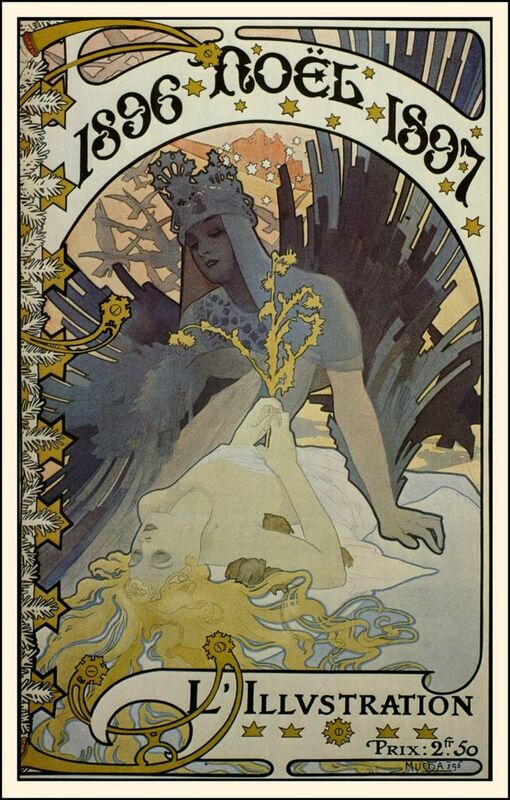 One holiday image that Mucha created while living in Paris is his Noél cover for L’Illustration at the end if 1896 (shown below). In this scene, Mucha depicted two female figures which represent the old year dying and the rise of the new year. Alphonse Mucha, “Christmas in America,” 1919. Approx. 32″ x 30″ (81.2 cm x 76.8 cm). Private Collection. One of the paintings that Mucha seems to have made at the start of his seventh (and final) visit to America is Christmas in America (1919, shown above).3 In this painting, a female figure, who is wearing a wreath of evergreen branches, looks out at the viewer. She holds a candle and fruit in her hand, as well as what appear to be either nuts or bells. It has been suggested that this image might be a commentary on the Czech traditions in America. This suggestion makes some sense to me, particularly because the floral patterns on the figure’s sleeves remind me a bit of those found on traditional Czech dresses. I love Christmas in America because the composition and colors are very calm, straightforward, gentle, and simple. To me, this woman personifies the goodness and peace that embodies the holiday spirit. May your holiday and new year be filled with such goodness, dear reader! 3 Mucha is thought to have arrived in New York in late 1919 or early 1920. I think this painting is a good indication that Mucha had already arrived in America, given the title. See Daley, p. 72.